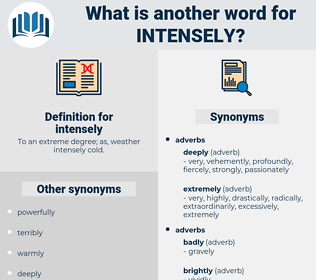 What is another word for intensely? To an extreme degree; as, weather intensely cold. 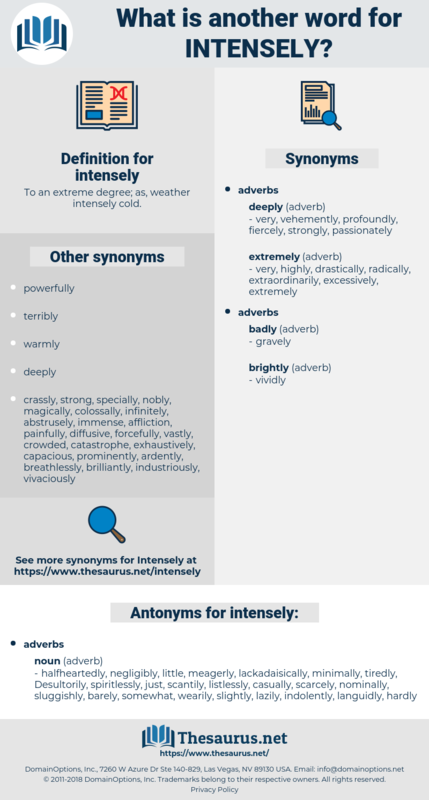 intently, fiercely, extensively, heavily, eminently, extremely, strongly, highly, acutely, keenly, passionately, excessively, extraordinarily, inordinately, exceedingly, energetically, incredibly, actively, strenuously, profoundly, immensely, very, closely, vigorously, exceptionally, vehemently, hotly, massively, tremendously, hugely, severely, overly, enormously, prohibitively, densely, forcefully, bitterly, terribly, violently, hard, thoroughly, gravely, aggressively, powerfully, robustly, supremely, sharply, greatly, utterly, firmly, disproportionately, seriously, abundantly, vitally, staunchly, intimately, widely, sorely, fervently, overwhelmingly, quite, emphatically, desperately, vividly, tightly, dramatically, strikingly, amazingly, critically, significantly, grossly, considerably. halfheartedly, negligibly, little, meagerly, lackadaisically, minimally, tiredly, Desultorily, spiritlessly, just, scantily, listlessly, casually, scarcely, nominally, sluggishly, barely, somewhat, wearily, slightly, lazily, indolently, languidly, hardly, marginally. This solitary, who was never so happy as when he wandered alone upon the downs with no human creature in sight, is yet intensely human. His voice sounded intensely suspicious in the night.